Lampropeltis alterna is a small species with amazing colors, alternating gray and red/orange stripes interspersed with black lines. Two patterns coexists : the “blairi” form, with large and bright orange stripes, and the “alterna” form, with thin and dark red stripes. These two forms were considered as subspecies until the 70’s. It is a predominantly nocturnal and crepuscular species, which occupies the rocky and dry areas, preying on lizards, rodents and amphibians. In captivity, it is a very easy snake once you have passed the test of the first meal, which can be difficult with some specimens. 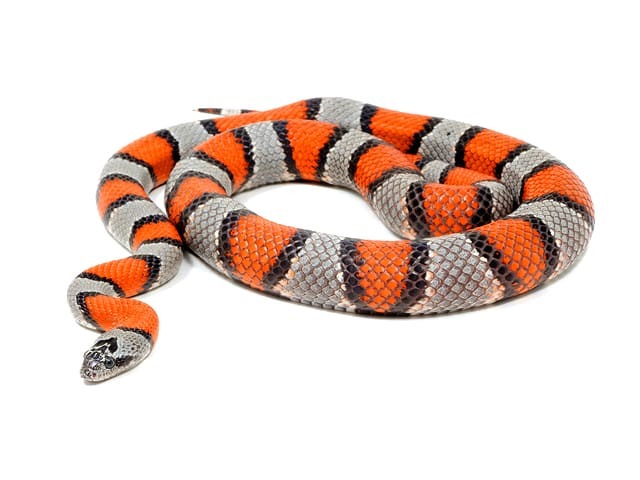 You can keep Grey-banded kingsnake either in terrarium or racks. For an adult, a cage of 0.8 x 0.4 meters (2.6 x 1.3 feet) is sufficient. Height doesn’t really matters for this terrestrial species. It’s not a very active snake so it doesn’t need much furnishings in the cage, but you can use rocks or dry wood to reproduce its biotope. Hidings are necessary, at each side of the cage. You can use virtually anything as hidings : trunks of cork, flower pots broken in half, pierced plastic boxes, or plastic hidings specially designed for reptiles you can find in pet stores. For its practical aspects, we use coco fiber and coco husk, but you can use any dry substrate like aspen substrate or hardwood chips. Just be sure that the substrate you chose is made for reptiles, and not treated with chemicals. You don’t need any additional light if your room have windows and natural light. If not it is recommended to provide a natural light pattern that mimics normal daytime according to the season. For heating, you can use heating mats or heating cables with thermostats. If your snake is in a terrarium you can also use heating lamps as a complement, but this species seems to prefer to catch heat from the floor, as they do in nature with warm rocks and trees. However, it’s not recommended to use heating rocks. It doesn’t need very high temperatures : 24-26 °C (75-78 °F) to 30-32 °C (86-90 °F) on the day, and 22-24 °C (72-75 °F) at night. Hibernation is very important for this species, and even more if you want to breed them. We put our specimens at 12°C (54 °F) for 2 months, with one month before to cool down temperature gradually and one month after to rise again temperature gradually. A bowl of fresh water is necessary. This species doesn’t seems to soak a lot. With this species, you should avoid high humidity : maximum 50%. Beyond, you risk respiratory infections. This species is a very good eater and gladly accept rodents. However, some newborns can be difficult to start. You can solve this problem by waiting several weeks (for us, even a month) after they are born to present them their first meal. If they still don’t want to eat, you can try feeding them with pinkies rubbed in lizard shed. With training by regular and gentle handling, you can accustom them to your presence. They easily become very calm snakes to handle. Like most Lampropeltis, defecation is often smelly and you will have to spot cleaning every time. They also sometimes defecate in the water. The snake should shed in one piece. If not, you can temporarily rise humidity. If the snake is stuck in his shed, a bath in warm water (30°C (86°F)) should be necessary. The first major problem you can encounter is the feeding of the newborns (see the feeding section). Also, the humidity level should always be low to avoid respiration problems, and especially during the hibernation period at 12°C. Apart from that, this is a very robust species.